The Australian Competition and Consumer Commission has announced that Armidale will be the third regional location to be studied as part of the petrol monitoring arrangements launched by the Minister for Small Business, the Hon Bruce Billson MP, in December 2014. These detailed regional market studies aim to explain each component of the prices paid at the bowser to understand why prices are higher in some regional locations. “Armidale petrol prices are among the highest in New South Wales. The average retail price of unleaded petrol in Armidale was 144.7 cpl in 2014-15, which was 10.6 cpl higher than the five largest cities (i.e. Sydney, Melbourne, Brisbane, Adelaide and Perth),” ACCC Chairman Rod Sims said. “This study will not only help us all to understand why petrol prices in Armidale are so high, but it will likely provide some understanding of why petrol prices in other regional locations in New South Wales are as high as they are,” Mr Sims said. The ACCC commenced its first regional market study in Darwin in March 2015 and its second in Launceston in May 2015. It expects to report on these market studies by the end of this year. “Our previous price monitoring work had a strong focus on explaining the common price drivers across Australia. Under the new petrol price direction we are now examining the price drivers that explain what is happening at a local level,” Mr Sims said. Companies throughout the supply chain will be required to provide information to the ACCC under the compulsory information gathering powers it has under section 95ZK of the Competition and Consumer Act 2010. “We acknowledge that using compulsory information gathering notices will have an effect upon those receiving them. However, we need to balance this against the need for information to understand pricing in the supply chain,” Mr Sims said. The ACCC is also interested in obtaining information from consumers, industry participants, stakeholders and any other interested parties regarding the petroleum industry in Armidale. On 9 December 2014, Minister Billson directed the ACCC to monitor the prices, costs, and profits relating to the supply of unleaded petroleum products and report at least quarterly for a period of three years. market studies looking at micro issues in considerable depth, including analysing the price drivers of petrol in three regional markets. The ACCC monitors fuel prices in all capital cities and around 180 regional locations across Australia. On 18 May 2015 the ACCC announced that it had concluded an investigation into whether there were any anti-competitive agreements between fuel retailers in Armidale. The ACCC did not find evidence of cartel conduct during the course of this investigation and subsequently ended its investigation. In concluding this investigation the ACCC noted that it is conducting a series of regional fuel studies and the outcome of this investigation would be considered in that broader context. Fuel prices in Armidale remained very stable during the first 40 weeks of 2014, and were observed as being higher than nearby towns. As this type of market behaviour can be an indication of underlying cartel conduct, the ACCC undertook an investigation of Armidale’s retail fuel sites. To attribute this pricing behaviour to cartel conduct by competitors, there must be evidence of agreements between competitors, and the ACCC was unable to find that. 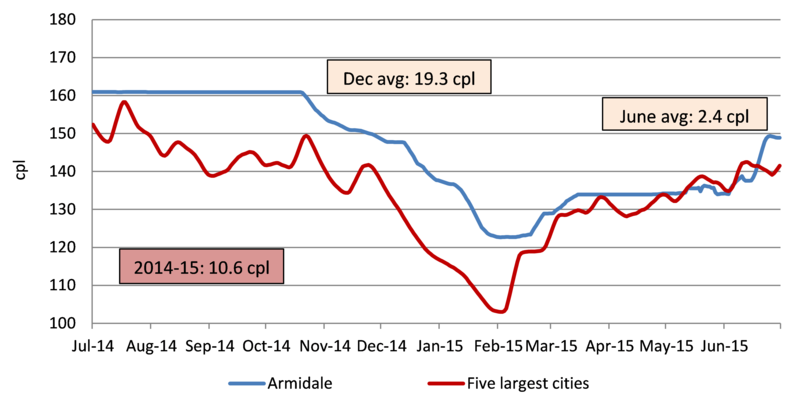 The chart below shows average petrol prices in Armidale compared with those in the five largest cities in 2014-15. The difference between prices in Armidale and the five largest cities in 2014-15 was 10.6 cpl. The monthly average difference reached a high of 19.3 cpl in December 2014 and decreased to 2.4 cpl in June 2015.